We make it easy, saving you time and money! Our online ordering system allows you to easily customize, price, and place your order from the comfort of your own home or office. You can view the complete cost of your order, including shipping, before placing it! You are buying direct from a major U.S. manufacturer. With over 200,000 sqft of state of the art equipment and over 35 years of experience, we provide quality at a price others can't match. Our vertically integrated business model has been designed from the ground up to eliminate undue process and focus on customer value. We control every step of the production process for our cabinet doors to ensure the quality you want at a price you can afford. We work closely with our lumber suppliers to select fine North American hardwoods using environmentally responsible sustainable forestry practices. By using our automated system your order will go immediately into production. We track each piece through the production process utilizing the latest barcode tracking technology. Our craftsman put their digital initials on the product as they sign off on each step of the production process as being complete. Our raised panel cabinet doors go through 24 distinct sanding steps ending with 80 micron (not 80 grain) cross grain buffing ensuring a super fine finish. Our careful blend of automated machinery combined with the hand detailing of our experience Craftsmen and women achieve superior results. Our raised panel solid wood 3/4" thick cabinet doors are built using mortise and tenon construction and pinned and glued in the joints for superior strength. The use of space balls allows the panel to float so that it can naturally expand and contract to withstand years of seasonal climate change. 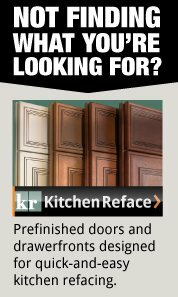 We gladly invite you to order a sample of our product and compare its quality to any other door manufacturers. Our online cabinet door design and ordering tool allows you to mix and match all available cabinet door and drawer style options to create limitless possibilities and truly unique custom designs without complicating the process. Best of all you can preview your new design and get live pricing all online. With literally thousands of possibilities we have the style you want. 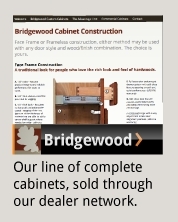 Click here to view popular styles in our online catalog or click here to begin custom designing a cabinet door unique to you. Most orders ship within 7-9 business days. You will receive an automated message notifying you when your order ships including the Fedex tracking number.